I started this build after playing trickster last league (self cast Ice Spear, self cast Worb), and while I did enjoy it the overall build felt lacking. With the buff to Trickster via Ghost Dance and Escape Artist this league I wanted to give it another shot, and use this as an excuse to test out how a spell-leech focused channeling build would feel. Thus I came to the decision to pick the incredibly non-meta skill: Winter Orb. I then researched ways that I could maximize my defenses, I found a combination of items that allow me to leech ES at an effective rate. Further reinforce my recovery with ES gain on hit from my Watcher's eye. Use block, and Spell Block and a small amount of Spell Dodge to further augment this (converting Block to damage with Arcane Swiftness), and then finally adding a combination of Blind/Evasion to further reduce incoming damage. I've been playing the build for around a week now, refining my gear and tree as I play. Currently I have done multiple deathless Uber Elder fights, a couple Delve bosses, and many Nexus bosses. I find map bosses, red beasts, and syndicate members to be trivial. Above all, this is one of the most enjoyable builds I've played in a long time. It feels strong, it feels smooth, it feels tanky and it does damage! - 8-9k ES allows you to tank large hits. - between 3.6m and 6.4m shaper DPS absolutely destroys endgame. - Layered defenses including Block, Blind, and Recovery. - Clears the screen in an instant. - Cannot do Ele reflect. - Expensive, sorry but you're not gonna be doing this on a 50c budget. - Gear can be restrictive, you might need to shop around. Roughly 80-100 ex total invested. Some expensive points would be the chest, weapon, Watcher's Eye, Bottled Faith, and Unnatural Instinct. the build scales amazingly well with gear and investment and I greatly enjoyed crafting the gear and enhancing my defenses/damage. As of my current gear I do 4.8-10m shaper dps depending on what is up, and have just under 10k ES. This should cost you around 25 ex total, and I think is a more accurate reflection of what endgame gear for this build would look like, if you like crafting then your gear will likely be significantly better than the above. This is what I would call a minimum in gearing to do content such as Uber Elder comfortably, with practice on the fight this gear is more than plenty, and I would estimate costs roughly 10 ex at current prices. 0.3.1 Want a super cheap ~3-4 ex (price subject to change!) budget option? Keep Shroud of the Lightless / Light of Lunaris, drop Dying Sun for Wise Oak and drop the weapon for Beltimber Blade. Buy ANY cheap Watcher's eye with "30% increased Maximum total Recovery per second from Energy Shield Leech while affected by Zealotry" this will allow you to clear maps, farm up gear and build your budget for the endgame. ***NOTE*** Prices are subject to change, some items listed in the above PoBs may drop to 5c, or have their price increase by 5 ex. Help Alira, the Crit Multi and Resist is too efficient to give up. Soul of Solaris, this pantheon gives a huge amount of defensive utility, many dangerous abilities are area damage and as with most defensive setups the more different sources of damage reduction you can stack the more effective each becomes. Make sure to fully upgrade this. Soul of Yugul, when fully upgraded gives a further 5% damage reduction applied to cold damage, many of the most dangerous enemies in the game such as Aul, the Crystal King and Uber Elder use cold damage. You can alternatively use Soul of Gruthkul, or Abberath. The purpose of this guide is to cover the endgame, so I will not be going into extreme detail about the leveling process. I leveled this build using Divine Ire and x2 Princess Unique Saber. None of the other gear is especially important, I used a 4-link for the entire leveling process. You can use Worb, Divine Ire, or Storm Burst with very few changes to the skill tree/gearing. I leveled as a life based character, wearing ES gear when I could to add a bit of effective HP. Swift Killer carried my damage for a lot of the leveling process, I was squishy but with proper positioning it was doable. At L70 I converted over to CI after killing Kitava and farming Blood Aqueducts a bit. I used shroud of the Lightless and added my Rumi's, Light of Lunaris, Circle of Fear and a cheap Watcher's Eye to aid in ES leech recovery. This is also where I began to fill out my Crit nodes so that I could fully take advantage of the damage from Light of Lunaris. For the endgame it is important to pick up your Dying Sun, Ruby Flask so that you can gain damage from more Winter Orb projectiles overlapping. Focus on getting resists and ES on gear, if you run into issues with damage, look for more damage focused upgrades next. If you are dying look for more defensively focused upgrades next. Have you ever seen an item, stopped and said wait.... what!? This does everything! That is how I feel about Light of Lunaris. This shield really is a core part of the build and has many important mechanical interactions. First of all, you must buy a shield with AT LEAST 32% Chance to Block, this is because "Arcane Swiftness" Gives 5% Increased Spell Damage per 5% Chance to Block Attack Damage. With 32% on the shield itself, 5% from Arcane Swiftness, and a further 3% from Tempest shield. we have 40% chance to block, and thus 40% increased Spell Damage. Light of Lunaris also gives 1% Critical Strike Multiplier, per 1% chance to Block Attack Damage, and 25% to Critical Strike Multiplier if you have dealt Non-Critical Strike recently. This means that we gain 65% Critical Strike Multiplier from the shield. We can further increase the damage and defensive value of Light of Lunaris by using Rumi's Concoction, while this flask is active we gain 20% Chance to Block Attack Damage and 10% chance to Block Spell Damage which is a great additional defensive bonus, while also giving us 20% Critical Strike Multiplier and 20% Increased Spell Damage. Finally, Light of Lunaris adds 39-60 (this has a range) Cold Damage to Spells, which I combine with Wave of Conviction on my CWDT setup to apply Cold Exposure to the enemy. Wave of Conviction hits a wider area than Frost Bomb, and applies faster. You could also self cast this if you wished, but you need a low level Wave of Conviction unless you are using Hatred because COLD damage must be the highest type of damage dealt to apply Cold exposure reducing enemy Cold resistance by 25%. 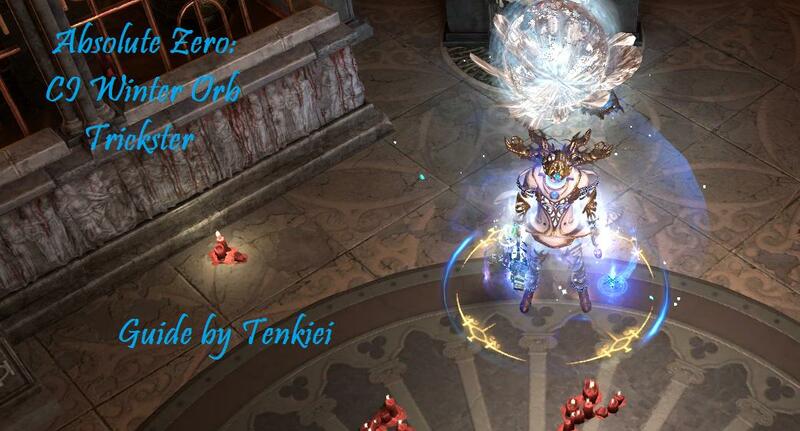 Winter Orb is a Projectile skill that impacts with the ground and "splashes" the more projectiles you fire, the more of the "splashes" will overlap dealing damage to a single target. This means that we combine Winter Orb with Greater Multiple Projectiles, and Dying Sun for a total of 7 projectiles. Roughly 5 of which will overlap most of the time yielding 3.6m Shaper DPS to 6.4m Shaper DPS. As a small bonus, Dying Sun also gives area although I am unsure how much this effects the odds of overlapping because it seems to increase both the radius of the AoE when splashed, and the spread at which the projectiles fire. This amulet is extremely strong both offensively, and defensively. It will cause your Winter Orb hits to penetrate 20% of chilled enemies cold resistance. Defensively it causes your hits against Chilled Enemies to blind them, giving you a 50% chance to Evade attacks. When enemies hit you, they will be chilled. Given the high damage this build does, it is realistic to assume we will be chilling almost everything in the game. If you ever run up against content that you cannot chill such as Aul the Crystal King deep in delve, you may wish to run a chilling zone such as Vortex or Cold Snap to guarantee the blind/pen. I'm expecting Bottled Faith to see a nerf soon. If you run the Zealotry Aura, most rare or unique enemies will always be standing on consecrated ground. This gives you BASE critical strike chance, which is multiplied by your increases to Critical Strike Chance (564% in super endgame gear). If this was all the flask did then it would be fully worth using. However it also causes enemies standing on consecrated ground created during the flask effect to take 7-10% Increased damage from all sources. You can essentially read this mod as "deal 7-10% more damage to enemies standing on consecrated ground"
I further combine this with a Zealotry Watcher's Eye causing enemies to take 8-10% increased damage while standing on consecrated ground. When combined with Bottled Faith, you can read this as "Deal 15-20% more damage to enemies standing on consecrated ground"
This eye has the additional effect granting you (20-30) Energy Shield on Hit. This build hits at an incredibly high rate (Winter Orb alone hits 37+ times a second, plus the hits generated by Storm Brand, Tempest Shield, and Wave of Conviction. If we assume 40 Hits per second as an average, this means we recover 1,160 ES per second on single target from this Watcher's Eye mod. When combined with the 2,390 we leech this is 3,550 per second which provides strong recovery. It is largely due to this Life on Hit in combination with Leech that makes this build feel as strong as it does. If you are lacking in funds and not sure which of the expensive items to take, you feel your damage is in a good spot but your defenses are a little bit iffy, grab any Discipline ES on hit eye, and enjoy the easy life. NOTE: You can optionally take Zealot's Oath to add 600 ES Regenerated per second while on consecrated ground. Personally I did not feel this was worth the 2 point investment. This build uses the unique Jewel Unnatural Instinct, placed to the right of the Scion start. Unnatural Instinct gives you the benefit of ALL unallocated passives within its (small) radius. Might of the Meek has a large radius, and increases the effect of all allocated small passives by 50% but prevents Notable (medium) passives from granting bonuses. Winter Orb - Greater Multiple Projectiles - Infused Channeling - Controlled Destruction - Cold to Fire (if using Shroud) Otherwise: Hypothermia - Efficacy (for mapping) or Cold Penetration (for bossing) If you have no white sockets you may substitute in Energy Leech Support on bosses. Cast When Damage Taken - Immortal Call - Tempest Shield - Wave of Conviction or Frost Bomb You can use Frost Bomb as an alternative, but Wave of Conviction is more effective with this setup. Storm Brand - Curse on Hit - Assassin's Mark or Frostbite - CWDT or Blind. you will want some sort of Curse application, you can either automate it with CWDT (if so you may opt to use Ball Lightning as it performs better on packs of enemies). Or run Blind support and cast Storm Brand manually if you do not have Pandemonious. You can also self cast this and add Onslaught Support, to boost your damage as you will have 100% uptime on bosses. Longer duration on your Burst window. Level 1 Divine Ire in a weapon swap, channel to gain Power and Frenzy charges before combat. Look for a 1-handed weapon (most likely a Dagger, Scepter, or Wand), the most important stat to look for is 16-20% of Elemental Damage as Extra Chaos Damage and you will ideally want to pair this with 23-25% increased Cast Speed. Non-Chaos as Extra Chaos Damage / Elemental Damage as Extra Chaos Damage / Cold Damage as Extra Chaos Damage > Cast speed > Spell Damage / Cold Damage / Cold Damage to Spells / Critical Strike Multiplier > Critical Strike Chance for Spells / Lightning Damage to Spells / Fire Damage to Spells / Penetration. Fire, Cold, or Lighting damage to Spells, Hybrid Spell Damage/Mana, Damage Penetrates Elemental Resistances, or Damage Penetrates Cold Resistance are also good stats to look out for. Play around with the parameters and import weapons into PoB to see what gives you the most dps. Look for a shield with at least 32% Block chance, beyond that try to get high rolls on the Damage to Spells > Spell Crit > Energy shield. Having at least 32% block chance is VERY IMPORTANT, because Arcane Swiftness functions in lots of 5% so if your total chance to block attack damage is 39% you will have 5% less spell damage than if it was 40%. Any ES helmet will work, you can go for a vanilla ES base. A Shaper helmet or Elder helmet with added damage to spells. You may also wish to use a Synthesized Hubris Circlet with something such as +30 To Maximum ES as an implicit. Try to get a Winter Orb enchant on your helmet. +2 Maximum Stages is the best, but Damage or Area of Effect per Stage is better than nothing. If you want to craft a helm from scratch using a white base I would suggest using Dense and Frigid fossils, so that you can have the suffix "of the underground" nearby enemies have -9% to Cold Resistance. It won't be too difficult of a craft I unfortunately couldn't do this because I needed the fire res on my helmet (Frigid fossils prevent any "fire" tagged affixes from rolling). Any ES gloves with resists and Strength or Dexterity. You can craft these yourself using Dense Fossils, or purchase them. If you want something more expensive I suggest Fingerless Silk Gloves, Temple gloves with "Increased Damage with Hits against Chilled Enemies" or Synthesized gloves. I feel like gloves are the ideal slot to roll with a Hollow Fossil, so that you can boost your max ES even further (and boost damage with an abyssal jewel). It is easier to roll the gloves with hollow fossils as all you need is ES whereas on your boots you will likely want movement speed. Again just any old ES boots with ES, Resists, and Movement speed. Nothing too special is required, you can use Sin Trek while gearing up or craft yourself some high end Synthesized boots like mine (il84). For lab enchants cold damage if you've been hit recently, or damage penetrates if you haven't killed recently are the best offensively. You can make a decent base using il84 Sorc boots, and two other boots of any ilevel all 3 with the same fractured mods, craft Flat energy shield onto them (reroll till you hit 34 on all 3 for best results) and then spam either Dense fossils, or Dense/Shuddering. A corrupted Bated Breath with Increased Maximum ES or Discipline Aura effect is great, if you want something with resists on it, you should craft on a crystal base using Frigid and Dense fossils. You can additionally use a Shaper base to give yourself access to the % Increased Maximum Energy Shield prefix. If you want to get deep into the crafting rabbit hole, you can craft a belt like this. I used belts with fractured Fire or Lightning Resistance, and fractured To Maximum Energy Shield, then rolled my Dense/Prismatic Fossils (likely not worthwhile as I never hit Body Armor + Elemental damage so you may wish to just stick to Dense). For one ring I use Circle of Fear for the damage boost it gives, while also reducing Herald of Ice mana reservation so that I can run Zealotry, Discipline, and Herald of Ice. If you have an Enlighten 4 and Influence, Sovereignty, or Leadership you may be able to drop this for Mark of the Shaper, a high end shaped ring that adds damage to spells / spell damage, or a Circle of Fear with Increased Buff Effect / Increased Cold Damage. Ideally you will want to buy this or synthesize it yourself with 6-7% Increased Maximum Energy Shield and -2 to Mana cost of Skills. This can be accomplished by combining a fractured Circle of Fear with -30-40% Herald of Ice Mana Reservation and rare 2 rings with 2 fractured properties. You will want the fractured rings to have +26 to Maximum Energy Shield and any matching second fractured affix. Scour both and craft -6 or -7 to mana cost of skills (Totaling 13). 33% chance for 1 implcit. 66% chance to 2 implicits. 50% chance for a useful second herald affix. 66% chance to get 1 of the affixes you want. 33% chance to get both. and ~27% chance to get something usable. For the other ring, anything with +To Maximum Energy Shield, resists and an open prefix will do. You want to be able to craft at least -6 to -7 Mana Cost to Skills on it, so that you will be able sustain your mana costs channeling Winter Orb. Winter Orb is playable with this build at 14 mana cost, but it feels a bit clunky. This can feel better if you have a larger mana pool. You ideally want to be able to channel your Winter Orb for 1.5 seconds for it to feel smooth from my experience. For me this is smoothest at a mana cost of 10 which is achieved by -9 on this ring, and -2 on my Circle of Fear. Just use Pandemonious, the combined damage and defenses it offers makes it irreplaceable to me currently. You can alternatively use a Solstice Vigil, or rare amulet. Solstice Vigil will allow you to maintain Worb at higher stacks for longer while mapping, a rare amulet is often much cheaper. An Aul's Uprising for Zealotry would also be worth considering to allow you to pick up Aspect of the Spider somewhere on gear. If you're on A Budget get a Shroud of the Lightless instead. You can also get one that is corrupted with +2 to Duration, AoE, or Projectile gems to further increase Winter Orb damage. If you want to use a rare chest, look for a Carnal Armor, or Sadist Garb, ilevel 86 either Synthesized with ES or Evasion implicits, or Shaper Touched and roll it with Dense / Aetheric (and optionally Sanctified) Fossils. Dense will potentially give you 25-50% Increased Evasion and Energy Shield, Aetheric will potentially give you a pseudo 7-link with Socketed Gems are Supported by Level 1 Arcane Surge, and on Shaper Touched bases give you a better chance to roll Spells have +1-1.5% Critical Strike Chance. This is again Base Crit which means it is multiplied by all of your increases from "% Increased Critical Strike Chance"
The reason we use an Evasion/ES base is because Escape Artist causes your chestpiece to grant +1 to Energy Shield per 6 Evasion Rating, which allows us to double dip a bit on our defenses by picking up chance to Evade while also stacking ES. Bottled Faith is an extremely powerful damage flask, for almost all builds (especially so for crit builds). Diamond Flask is a must have for crit builds. Of heat to remove/prevent Freeze and Chill. Diamond Flask causes your critical strike chance to be rolled twice, and the higher roll taken. What this means is if the game rolls twice, and on one roll you would not crit, and on the other you would it picks the one where you will crit. Rumi's Concoction added defenses and damage as covered earlier. Quicksilver flask for movement, of Warding to be curse immune. Dying Sun is strongly advised, as explained earlier. If you cannot afford some of the more expensive options it's worth considering a Wise Oak just make sure Cold Resistance is your highest uncapped resistance uncapped being the right hand number IE: 75%/(112%) on your defenses page. The Might of the Meek, and Unnatural Instinct were explained earlier so I'll skip over those here. Energy from Within grants you higher Energy Shield by transforming the nodes near Melding from 25% Increased maximum Energy Shield to 40% Increased maximum Energy shield. When searching for Watcher's Eye mods I would look for an eye with one defensive line, and one offensive line. 20-30 Energy Shield Gained for Each Enemy Hit while Affected By Discipline, this is the strongest single mod you can get and provides a huge amount of defense. You can use 30% Increased Maximum Total Recovery Rate of Energy Shield while Affected by Zealotry, this is weaker, but still solid (it will give you ~600 ES/sec vs ~1200). This also means your second property would need to be Zealotry related. Both of these mods grant extremely high offensive power, but require you to run Hatred which will lead to less quality of life and less effective damage due to enemies not being on consecrated ground as reliably. These are both strong offensive mods for Zealotry, and are what you should try to combine with Discipline ES on hit for the best mix of offense, defense, and effective damage. The last jewel should be any rare jewel with "Corrupted Blood Cannot be Inflicted on You" if you have that one one of your unique jewels, then search for applicable modifiers to Max ES > Critical Strike Multiplier > Cold / Spell Damage > Critical Strike Chance. Have another boss you want to see? Let me know! Can I play this as an Elementalist? No you can't. You'd need to find or make a different build for Elementalist. Can I play this as an Occultist? Yes you can! Take Void Beacon first while leveling, then Wicked Ward / Vile Bastion after Uber Lab transition by removing Void Beacon for Profane Bloom and Malediction. You will need to change your Curse on Hit setup to apply 2 curses which means dropping Blind/CWDT. Much of the rest of the build is the same, I suggest an Incandescent Heart or crafted Vaal Regalia. Hey everyone - I just wanted to give some feedback from an HC standpoint. I am absolutely LOVING this build. I've sunk most of my currency into this build and it wasn't cheap. HC community isn't as good as SC but it's for sure manageable. I wanted to min/max some of my items so I went for some amazing rolls on things. I killed Shaper at level 82 and I have SO many missing points into crit - I presume I would be able to take him down even faster at level 90+. Build feels smooth... reliable... and most importantly fun. I am a HoA player and use to having 16-18k ES but with this char I am sitting about 9.1k and it feels safer than my Agony did at half the ES. The leech is insane and recovery is phenomenal. FYI - The creator of this build is also amazing and spent most of the day answering my questions. He even went on stream to help me with one of my legacy builds. I will continue supporting this man and wish him the best of luck in the future. Also, don't hesitate to ping me in-game guys as I can walk you through anything HC related - been playing ONLY HC since Beta. It would be very difficult to play on SSF, as the build hinges upon Light of Lunaris for a lot of its defenses and damage. If you have this, then yes you can probably make substitutions for the other pieces. Yes, all of the bosses I have faced so far have been handled quite well by the build. I am hoping to find Aul soon for further testing. Does Wave of Conviction apply Cold Exposure? Yes it does, so long as the spell does more Cold damage than it does Fire or Lightning Damage. How does this compare to Elementalist? Feels better on single target, has much better defenses, is slightly more expensive. How does this compare to Eternity Shroud builds? In terms of raw numbers, lower damage. But in most cases it will feel better to play as you'll actually be able to take a hit and survive. Minor clarifications to mechanics & updated some gear. Updated gear to include my new helmet/gloves. Kurgal, Uber Elder, and all 8 Guardians added. Clarified mana costs and ring crafting, updated my PoB & belt setup. Upgraded gear explained a bit more, clarified weapons. Clarified in-depth explanations more, added a super budget TLDR. Updated trees for L100 variants. Also what about Energy Leech gem? Doesnt it BiS for WO setup? Energy leech is ~40% damage while you are leeching energy shield. However this build tops itself quite quickly in which case the value drops to 24%. If we assume you're spending equal time leeching, and at full, (realistically you will spend more time at full than leeching) this means an average value of 32% or lower. In my current gear Slower Projectiles or Added Cold damage is roughly 31%. So while you can use Energy Leech especially if you don't have the Discipline Life on Hit gem it's not a huge damage boost and is inconsistent. If we're talking eternity shroud, are we talking the life version? or CI? - speed (Everything on the screen is dead either way, picking up a Solstice Vigil or Headhunter on any version will increase your mapping speed). Hey mate, I am thrilling with the build right now, but I am having strong mana issues, what should I do? There is nothing addressing mana in the guide, I got enlighten level 4 but my mana is barely enough with all auras and I run out of mana even without Zealotry. Can you please help me out? Do you have -6 to -7 to Maximum Mana costs on your rare ring? If not that would be the first place to start as otherwise you won't have enough mana regen to sustain your mana costs. The build uses extremely low mana regen because the cost on Winter Orb goes as low as 10 in final gear, it is a little awkward but playable on as high as 14. If this still is not enough, you can opt to drop Influence, and pick up Sovereignty (you will need to steal 2 points from somewhere to do this). That should allow you enough unreserved mana to channel for longer, or even to add clarity if you desire. When possible you want to channel in medium length bursts so that you keep Infusion up and refresh charges via Swift Killer, so try to avoid the habit of standing in place channeling Worb where it channels once - you run out of mana - it channels - you run out of mana. This is a bad habit I myself have fallen into a few times. Later tonight I'll clarify the mechanics section to explain about the mana. Thank you, I invested in a new ring and crafted the prefix - the mana situation is way better now. Thanks for the attention and for the mechanics tips as well, I will keep an eye on your updates and keep posting! Great guide, I am really enjoying the build, can't wait to get better gear and more levels. You're welcome, and I'm glad you're enjoying the build. So it seems trading out the mainhand for beltimer is not a bad option at all. You lose damage obviously, but gain 2 projectiles (using your POB, the 776154 dps per projectile goes down to 484860 dps per project , but 5 projectiles (3.8M) vs 7 projectiles (3.4M) and that is without counting Far Shot giving another 30% more potentially. Given you can get the beltimer for like...20 chaos, that might be an easy way to save a lot on this build.